The highlight of my summer is the Peach Truck peaches. If you’ve never had them, you should leave whatever you’re doing right now, find a truck, and GO BUY A BAG – or 3. The peaches are juicy, perfect, sweet, luscious… I could go on and on with the adjectives. Just trust me – they are one of summer’s special healthy treats. 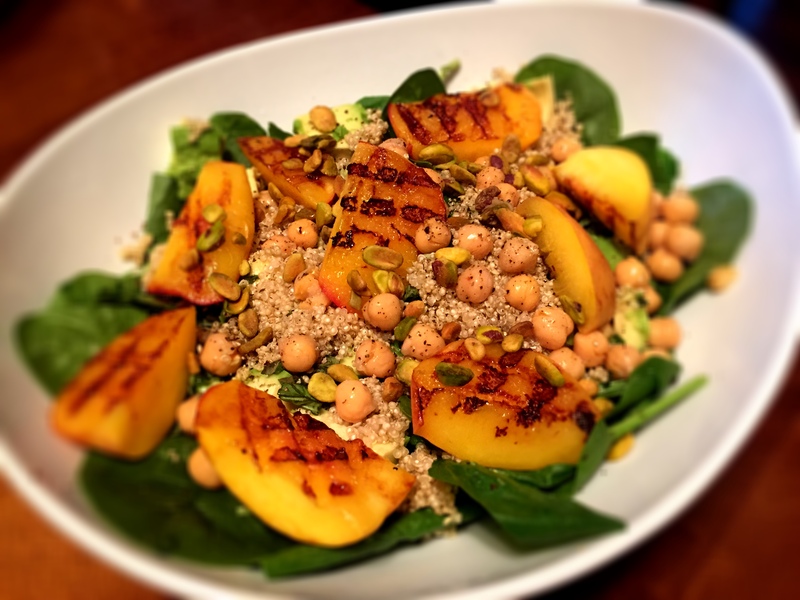 I was inspired by a post off of one of my favorite blogs – Love and Lemons, and decided to make my own twist on a summer peach salad. So, I did! And it rocked!! In fact, I have leftovers for lunch today, and lunch can’t get here fast enough. As for the dressing – I of course didn’t measure anything, so taste it before you serve and add or take away whatever you need. I didn’t measure anything in the salad either – haha! So, add or take away at your own pleasure. The main thing is to get fresh ingredients! You can’t go wrong with this salad – it’s a crowd pleasure for sure!! Happy summer y’all! Cook your quinoa according to directions. I made 1 cup (uncooked) and had a lot leftover. Heat a grill pan or fire up your grill. I just use a cast iron grill pan inside for quick and easy grilling with not much cleanup! I head it on medium heat and spray with coconut oil spray. Cut your avocado and basil and assemble all of the elements on the salad together! Drizzle with homemade dressing below and enjoy! Mince your garlic and mix all ingredients together! Taste and add more or less of whatever you desire! Beautiful salad! And such a wonderful combo.